UMP | University of Minnesota Press Blog: Book Ends: On writing, being, and sensing an ending. Book Ends: On writing, being, and sensing an ending. It is not to be expected of critics as it is of poets that they should help us to make sense of our lives; they are bound only to attempt the lesser feat of making sense of the ways we try to make sense of our lives. Ending books (just like lives), good, bad, or indifferent, is difficult. Eschatology beckons. Come the end, at the moment of the letting go, there’s always an urge to keep writing and to promise more than you should. Surely all those words stacked up behind you mean something. What has all this been for? It’s a moment of pure ideology (which is to say it’s real or anticipates the reality that the words might make). Different writers handle the problem in different ways. Some don’t handle it at all. One of my favorites is Frank Kermode’s The Sense of an Ending (1966), whose opening sentence seeks to inoculate the book against the expectation that the words that follow will matter, which, of course, only makes them matter more. Critics are not poets. They don’t actually help. Or, better yet, they help sort out the help poets offer. I am not sure that Kermode or his slippery negative analogy really believes this. Critics may not make sense of lives or the world but the sense they attempt to make still constitutes a “feat” even if it is “lesser” than that to which poets are supposedly bound. The difference maintained here between poiesis (making) and critique (reading, receiving, responding, but only breaking when you have to) entails a sweet evasion to which, like Kermode, part of me tends to cling. What Kermode describes is really a circuit of making and unmaking, all part of the process of somehow making the sense you feel, feel adequate. Kermode’s lines are not immodest even if they play, in part, as a modesty topos, and, in fact, suggest that you may be forgiven for thinking critics poets and poets, critics. Best to be on your guard at endings and beginnings. Do your best to be skeptical and completely naïve—preferably in the same gesture. In my case, come the end, I was haunted by a sentence that I wanted to write, indeed, I did write, several times, but then, in every iteration, immediately deleted. The cadence was wrong, the sentence at once too little and too much. I shall write that sentence one last time at the end of this post. Allow me to explain. Of Sheep, Oranges, and Yeast: A Multispecies Impression is an attempt to craft scripts for humanities-based work (aka reading and writing) that simply take it as read that “what we call ‘humanity derives … from a spatial and temporal web of interspecies dependencies.’” How do we read and write now if we just assume that all the texts, all the artifacts we study, come crowded with forms of writing or coding otherwise than human, traces that our own acts erase, obliterate, but also render sensible, knowable, by taking so many others as a substrate for our own acts of inscription. Throughout the book, I assume that our archives and stories are marked by animal, plant, fungal, microbial viral, mineral, or chemical actors. This fundamental shift in what counts as description and reading designates the stakes to the book’s subtitle—“a multispecies impression.” Human forms of writing or coding routinely cohabit with forms of writing and coding otherwise than human that contribute to, constrain, and interrupt the kinds of sense we make. Methodologically, then, asserting the interspecies basis or multispecies dependency of our lives no longer counts as much of a revelation, output, or thesis. On the contrary, the multispecies basis to our lives functions as a straightforward given or input that requires us to re-describe our objects. I found, for example, that it frequently makes better sense to understand supposedly human conflicts as contests between rival multispecies groups of human, animal, and plant actors. Different kinds of “writing” or coding face off in order to build or occupy different kinds of worlds. And those worlds are built and maintained by differing configurations or matter-metaphors that undergird categories such as “human,” “plant,” “animal,” parceling out and strategically confusing them in the process. I organized the book with an eye to different scales of being or forms of finitude keyed to animal presences (sheep), plants (oranges), and fungi (yeast). But what took me by surprise was the way the categories blurred. Modeled as “stock” sheep morphed into plants and back. By their recruitment of animal actors as a dispersal strategy, oranges grew legs and beaks, hands and feet, went mobile. The airy bubble of yeast’s fermentation offered itself as an icon of what counts for us as the solidity or stability of an infrastructure. The story I was telling became a series of anthropo-zoo-geneses—the co-making of different beings. Problem was that this altered mode of description didn’t seem to offer much more. There did not seem anything particularly progressive or affirmative about a multispecies account or modeling—at least not as such. The scripts I was crafting were just that: scripts. At best, they were entirely neutral. Come book’s end, the best I thought I could do was have the thing swallow its own tail. 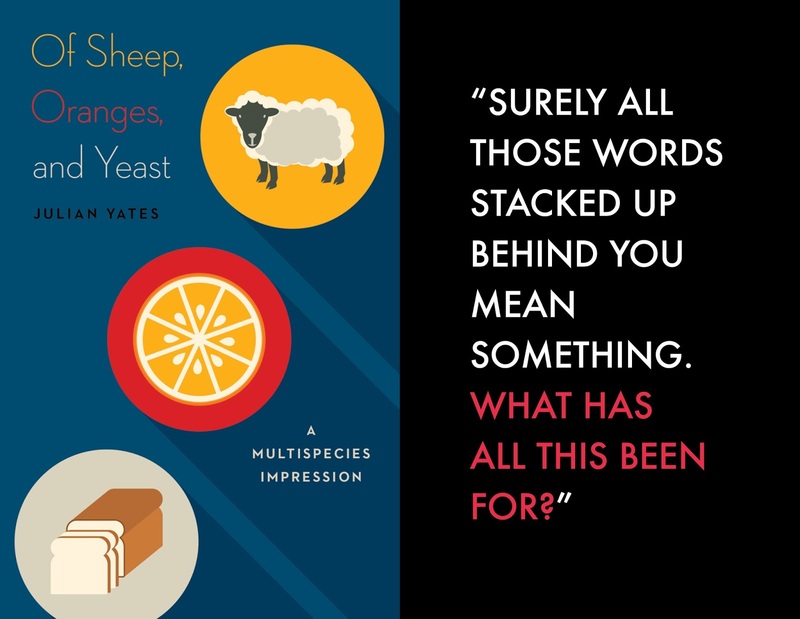 Of Sheep, Oranges, and Yeast begins with a chapter titled “Impression,” which establishes a mode of reading that subsequent chapters enlarge. As the chapters progress, I try to acknowledge the way the arrival of a new plant, animal, or fungal actor (who in truth was there all along) enables certain questions (inscribes) and disables others (erases). Best, then, not to end by kicking over the traces with a set of proclamations about the progressive cast to multispecies modeling. Best, instead, to own up to the neutrality of this word impression, and acknowledge the way impression cohabits with and comes funded by the erasure of other forms of writing and being, human and otherwise. Come the end of the book, all I had to offer was this sense of entanglement, of gain and loss. The book ends with the figure of “an empty page or the flicker of a blank screen,” the necessary fact of my words becoming a surface for someone or something else to “write” on or with. The book ends not with a promise but with an assertion that may or may not hold promise, that “the future, if there is to be one, requires us to imagine another order of world in common, a world that owns its existence as a series of competing, sometimes complementary, sometimes violent, sometimes sustaining multispecies impressions.” That’s the sense my ending sought to make. (I also refuse to show you a painting—but that’s a different story). A friend tells me, blithely, in the way that friends can, that I meant “praxis.” I think she’s wrong. I think I just don’t quite know what this thing that is “like a politics” but which knows no polis is yet. Of course, perhaps, that’s what she means by "praxis." 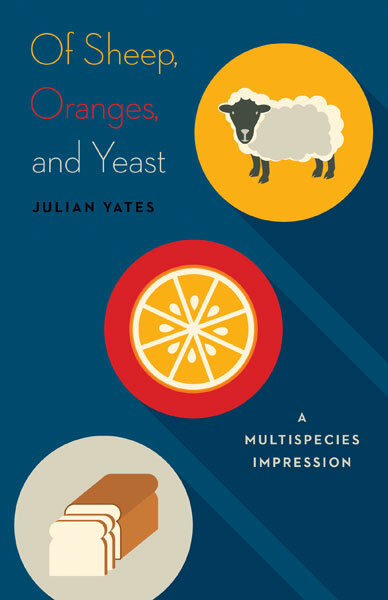 Julian Yates is author of Of Sheep, Oranges, and Yeast: A Multispecies Impression and Error, Misuse, Failure: Object Lessons from the English Renaissance. Yates is professor of English and material culture studies at the University of Delaware.